"You have no idea what's going on here!" 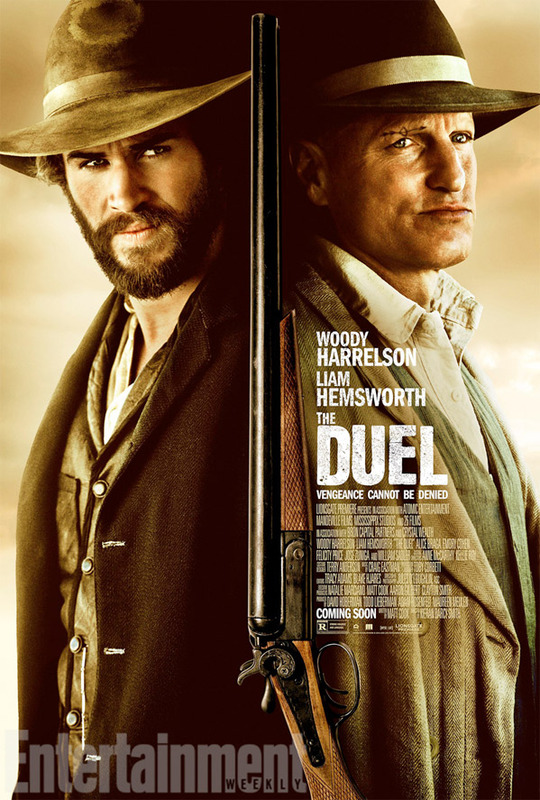 Lionsgate Premiere has debuted a trailer for a film called The Duel, formerly known as By Way of Helena, a western about a Texas Ranger who takes on an oppressive, violent preacher watching over a town. Liam Hemsworth plays the Ranger, and Woody Harrelson plays the evil pastor, and the two end up in a kind of standoff in this small town. The full cast includes Emory Cohen, William Hurt, Alice Braga, William Sadler, Benedict Samuel & Raphael Sbarge. This looks solid, but they do give away a big plot point in the trailer. Western fans might want to take a look. In the Great Plains during 1880s, Texas Ranger David Kingston is sent to an Old West frontier town Helena to investigate a series of murders and disappearances of local people. In the town, preacher Abraham Brant is keeping all the townsfolk in some kind of fearful grip. The Duel, formerly titled By Way of Helena, is directed by Austrian actor-filmmaker Kieran Darcy-Smith, of the film Wish You Were Here previously. The screenplay is written by Matt Cook. The film has not premiered at any film festivals or otherwise yet. Lionsgate will release The Duel in theaters starting June 24th, 2016 this summer. Anyone? Would be good news, love westerns too. This trailer looks intense. But is Hemsworth really the right dude to take on Harrelson? The line "By a twist of fate, this is the same man that murdered my father 20 years ago" is enough to question the underpinnings of the protagonist. He's the devaaaaaallllll! Might be entertaining, I like Woody. I would love The Western to make another run at it. They are always fun even when they aren't most excellent. William Sadler, Woody Harrelson, and an old west religious cult. Dig it.